Week three of high school is here and several teams are playing their last tune-up games before district play begins. The Nowata Ironmen will host Verdigris for homecoming in its third consecutive regional rivalry to begin the year. 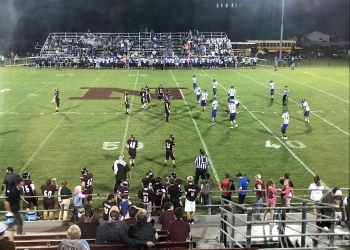 Nowata has suffered sizable losses to Dewey and Vinita to start the year, extending its losing streak to thirteen games. The Ironmen are seeing improvements on both sides of the ball as a young squad tries to gain varsity experience. However, some veterans have made an impact. Senior wide receiver Nick Steigerwald has found the endzone in both games this season. Nowata head coach Bob Craig credits those results to the work Steigerwald has put in. Class 3A Verdigris represents a challenge for the Ironmen. Nowata fell to the Cardinals 50-6 last year on the road. Verdigris is also winless in 2018 after dropping games to Sperry and Victory Christian to open the year. Coach Craig thinks that winner will be determined by who makes the fewest errors. Nowata’s homecoming kicks off at 7 p.m. Radio coverage can be heard on KRIG 104.9 FM starting at 6:45 p.m.